Today’s blog is from Anne Verbiscer, a research associate professor in the Department of Astronomy at the University of Virginia. 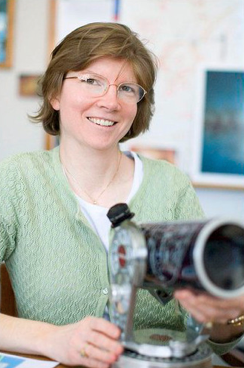 On the New Horizons science team she studies the scattering properties and composition of icy surfaces in the Pluto system and the Kuiper Belt. Every year, planets orbiting the sun beyond Earth’s orbit reach what astronomers call “opposition,” when they appear in the sky at the position opposite that of the sun. 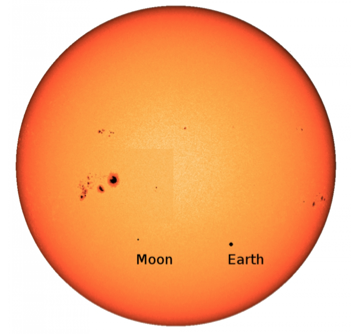 At opposition, the planet, or satellite or asteroid, and the sun line up with Earth between them. Pluto and its moons were at opposition this year on July 8, at 03:30 universal time. Sometimes these alignments are so precise that if you were standing on the surface of one of these bodies and looking back at Earth, you would see our planet transit (or move across) the solar disk. These “special” oppositions take place when the planet is near what is called the Line of Nodes at the time of opposition. The Line of Nodes is the intersection of the plane of the Earth’s orbit and a planet’s orbit. If the planet is near one of these intersection points at the time of opposition, it is in near-perfect alignment with the Earth and sun. Pluto was last near one of these intersection points in 1931 and will be again in 2018. After that, because of the eccentricity of Pluto’s orbit, it will be another 161 years until the next perfect alignment opportunity. The surfaces of airless bodies in the solar system all exhibit an “opposition effect.” This is the (sometimes dramatic) increase in reflected sunlight that occurs when a planet, moon, asteroid or comet is at opposition. The angle between the sun and Earth as seen from the planet is called the solar phase angle, or simply the phase angle. The opposition effect is the increase in brightness observed as the phase angle decreases to zero. Saturn and its rings and moons had their node crossing in January 2005, and several of the world’s telescopes were watching. The 2.2-meter telescope at Calar Alto Observatory in Spain obtained the three images below at different phase angles. When Saturn was at opposition on the night of Jan. 13, 2005, the phase angle decreased to 0.02 degrees and the rings became stunningly bright, far brighter than they were at a larger phase angle in February and even brighter than they were just one night after opposition. Why did the rings get so bright? And why did Saturn not get bright? The opposition effect is the product of two phenomena: particle shadow hiding and coherent backscatter. When a planetary surface or ring is at opposition, particles can hide their own shadows and contribute to an increase in brightness. Additionally, incident (or incoming) rays of sunlight can interfere constructively with sunlight reflected from the surface at opposition and increase the observed brightness. Atmospheres, however, do not exhibit dramatic opposition effects like the rings and moons do. Astronomers watching Saturn’s moons on the night of Jan. 13 were amazed to see Rhea, Saturn’s second largest moon, appear brighter than mighty Titan, Saturn’s largest moon which is covered by a thick atmosphere. Despite the fact that Rhea’s projected surface area is more than 11 times smaller than Titan’s, it was visibly brighter entirely due to the opposition effect. So what does the opposition effect tell us about a planetary surface? By carefully measuring the change in reflectance as phase angles get smaller and smaller, physical surface properties such as porosity, particle size and transparency can be discerned from the opposition effect. The quantitative analysis of how light is scattered from a particulate surface requires looking at all viewing angles, not just at opposition or at “full moon,” but all the way to “thin crescent.” As New Horizons approached Pluto last year, the phase angle was about 15 degrees, and through the encounter, the phase angles at which New Horizons instruments viewed Pluto and its moons grew larger and larger until they were finally viewing these bodies backlit by the sun at phase angles near 170 degrees. But New Horizons never viewed Pluto or its moons at phase angles smaller than 8 percent, far larger than the phase angles attainable from Earth and at opposition. Because of the size of Earth’s orbit viewed from Pluto, Pluto and its moons can never be observed from Earth at phase angles larger than about 2 degrees. By combining the data gathered by New Horizons at larger phase angles with data acquired from Earth-based telescopes, we can measure some physical properties of the surfaces in the Pluto system by studying the manner in which sunlight is scattered from them. Observations at larger phase angles tell us about surface roughness, while those at the smallest phase angles hold clues to the particle sizes and how tightly they are compacted, or the surface porosity. 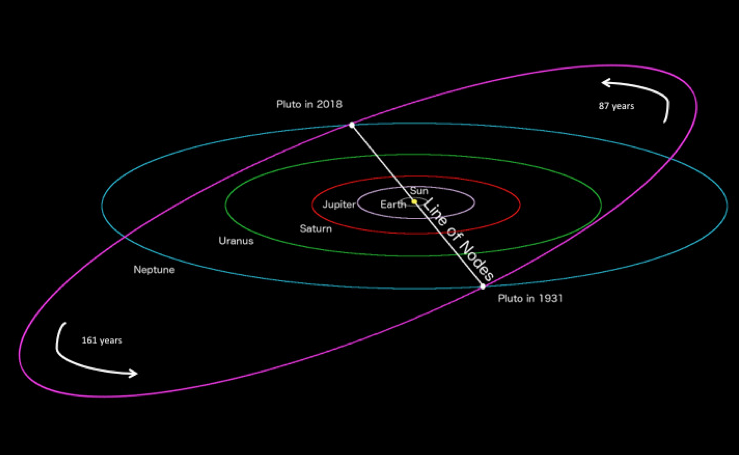 What will happen when Pluto and its moons cross their Line of Nodes on July 12, 2018? Charon is normally about half as bright as Pluto, but when is at opposition near the Line of Nodes, will it appear brighter than Pluto, like Rhea was brighter than Titan when Saturn crossed its Line of Nodes in 2005? Probably not, since Pluto’s atmosphere is much thinner than Titan’s. How much of a boost in reflectance did Pluto’s opposition effect give Clyde Tombaugh? We won’t know just how bright Pluto can get until 2018, but you can be sure we will be watching to find out, and to learn more about the fascinating surfaces of Pluto and Charon!